Rid your garage of unnecessary clutter and find space to park your cars, store your stuff and more! Declutter and reclaim your garage in just four easy steps with these expert tips from professional organizer Helena Alkhas. Alkhas, a military spouse, has moved her family five times in 10 years – her experience will help you make the best use of your garage. Do you want it just for parking the cars? Do you want to use it to store household and/or seasonal items? Do you want to create a living space, such as a play area, a mudroom or a workshop? Evaluate the size and layout of your garage to determine whether your plan is doable. Is this something I can inexpensively replace? If I keep this, will I have the space to store it? Trash: Check with your waste removal company to arrange a large one-time pickup. Donate: Make arrangements with the Salvation Army, Goodwill or other charitable organizations. Sell: Consider holding a garage/yard sale for sellable items, or list them on an online site such as eBay or Craig’s List. Keep: Sort the keepers according to the activity areas you defined in Step 1. Go through this process a couple of times if necessary. It’s easy to create and use vertical storage in the garage! Hang large items – such as camping tents and holiday decorations – from the ceiling. Create easy-to-access wall storage for items you need more often, such as pet food, bulk groceries and sports equipment. 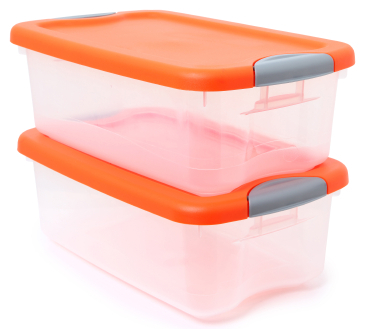 Store items in clear bins and totes – you can see what’s inside and they’re easy to stack. Color-coordinate your totes for easy identification: red and green lids for Christmas decorations, orange lids for fall decor and white lids for sports items, for example. Paint the walls of the various areas different colors. Add carpet tiles or snap-together flooring. Install extra lighting to keep the space nice and bright. It's time to make a plan, roll up your sleeves and get your garage back!